Metal extrusion in additive manufacturing is a fairly new process. 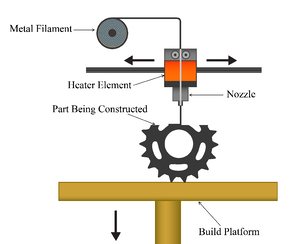 Similar to the wildly popular plastic-based FDM process, filament is heated and drawn through a nozzle and then deposited layer-by-layer. This filament is a combination of thermoplastic material and metallic particles. The nozzle moves in the x and y axes across the part for a given layer. The build platform then lowers to make room for new layers. After the part is complete, it is placed into a sintering furnace to burn out the remaining plastic and sinter the metal particles together. Extrusion-based additive manufacturing has been widely used for plastics and polymers, but only recently has developed to create metal parts. This post is part 5 of a guide by 3DEO meant to introduce engineers and designers to metal additive manufacturing. Subscribe to our email list to stay current on all of our articles. Fused Deposition Modeling (FDM; also known as FFF) is the name for the plastic extrusion process which was originally patented by Stratasys. Similar to binder jetting, the patent expired several years ago and the market saw a huge influx of new FDM-like processes from companies such as MakerBot, Ultimaker, and others. Markforged uses a filament-based process in their Metal X machine, and Desktop Metal will use a similar process in their lower priced Studio System. The metal filament extrusion process benefits from the significant investment in its sister plastic-based process with regard to the advances achieved in precision and low-cost components. Building on this popular existing technology has allowed for faster development in using metal filaments instead of plastics. This FDM-like process shines when used as a prototyping technology because it can print very fine layers and achieve the precision similar to plastic models, all while being relatively low cost. While metal extrusion is similar to all other 3D printing processes by building its parts layer by layer, it varies due to the material being deposited through a nozzle under constant pressure and in a continuous stream. This pressure must be kept steady and at a constant speed to enable accurate results. Unfortunately, the actual application of the technology tends to leave small voids and bubbles in the part resulting from the melted mixture leaving the nozzle as it’s applied in different directions. This has a significantly negative impact on final part properties and porosity. It is because of these final part limitations that manufacturers of FDM-based metal machines rarely advertise any production part applications. Though the previously discussed disadvantages preclude this technology from seeing widespread adoption for production metal components, it is not without its place in the additive manufacturing ecosystem. This is an extremely capable prototyping technology because of its fast build times and significantly reduced cost as compared to laser sintering. Metal filament extrusion 3D printing could very well become the go-to technology for cost-effective metal prototyping.